1.1 The Integrated Waste Management Action Group (IWMAG) supports a holistic approach to address the waste issue, with a priority on implementing measures to reduce the generation of waste. IWMAG believes that communities should take responsibility locally for the waste they generate and therefore advocates a regional approach to dealing with municipal solid waste (MSW). 1.2 The Government’s current plan (Plan A) of relying on the expansion of landfills and the construction of a large incinerator at Shek Kwu Chau (SKC) has met with widespread community objections and is simply not the answer to the problem. The proposed commissioning dates are too late, the solutions do not deliver sufficient capacity to handle the total amount of projected MSW, implementation is too expensive and it does not optimize existing land resources already used for waste disposal purposes, or which are currently under-utilised. 1.3 Government has said it has no Plan B, but this should not be the case if it is to respond proactively to widespread community concerns. Any alternative approach likely to be acceptable to the community, must be quicker to implement, less expensive, more sustainable, able to address the issues in a variety of positive ways, and be adaptable to changing needs and improved technologies. The current proposal should be abandoned and a “Plan B” adopted. The attached Figures summarize an analysis of the Government’s proposal and the basis for IWMAG’s “Plan B”. 1.4 IWMAG has formally submitted this Plan B proposal to the Town Planning Board. The application is yet to be heard. 2.1 The Government plan does not seek proactively to change community attitudes towards waste generation and offers no proposals for comprehensive waste separation or recycling. Recently announced proposals for reducing the amount of MSW, organic waste treatment and recycling are inadequate, being small scale and little more than window dressing. They do not address the key issue which is how to reduce the total tonnage of municipal waste. As a result the Government plan requires major investment in the expansion of the existing landfills and the construction of a large incinerator at SKC. The current Government treatment and disposal proposals will be inadequate to meet actual MSW volumes in the required time frame. What is Phase 2 – Another Incinerator? 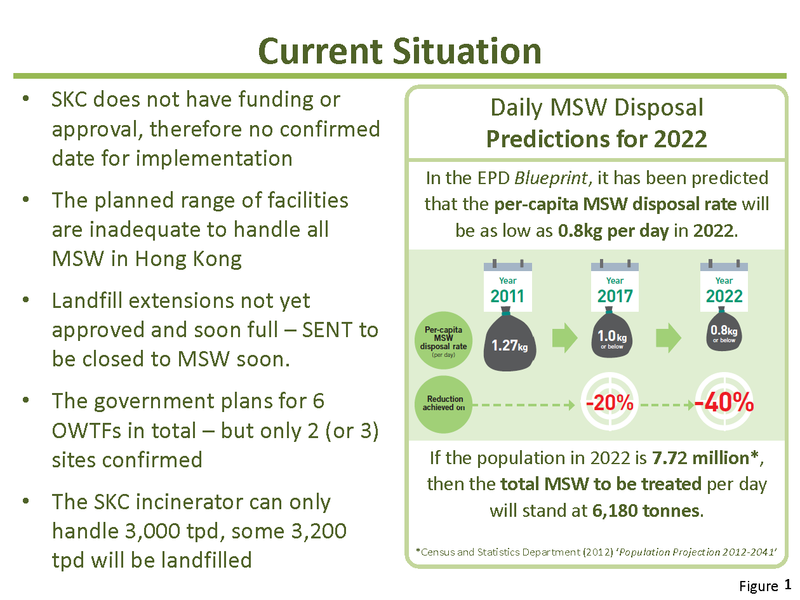 The Phase 1 Government proposals will result in approximately 2,100 tonnes per day (tpd) of MSW still being dumped in landfills. How this is to be dealt with has not been explained but it would seem likely that a second incinerator will be required. Other sites have not been formally identified in Government documents, although a second incinerator is thought most likely to be located at the Tsang Tsui Ash Lagoons (TTAL) site. 2.2 The Legco briefing paper refers to the planned incinerator at SKC as Phase 1 but there is no mention of Phase 2. The Government should be required to now state clearly whether Phase 2 means a second large incinerator at the TTAL site in Tuen Mun and inform the whole community of the timetable for the Phase 2 project. 2.3 The existing landfill sites are huge by world standards and, given Hong Kong’s scarce land resources, they are a massive miss-use of land, as they are only used for land fill purposes rather than for multiple functions relating to waste management. 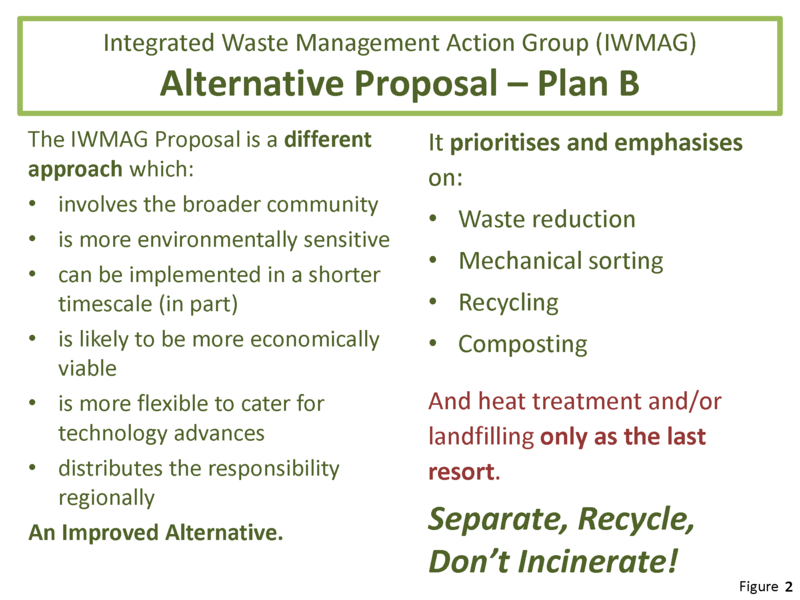 IWMAG has proposed that permitted use of these sites be broadened – for instance the sites were never considered for the location of incineration facilities – even though there is great potential for synergies with other forms of waste management and economies of scale. These sites should be considered as suitable locations for fully integrated regional waste treatment facilities and significant investment should be made by the both the public and private sectors to achieve this. 2.4 High capacity waste sorting equipment forms a significant part of integrated approaches to waste management in other countries. Depending on the relevant circumstances, the use of high capacity waste sorting plants can reduce the amount of MSW going to landfills by up to 80%. The 80% of the material recovered is then sent for various forms of recycling and re-use. The remaining 20% is then forwarded to waste-to-energy plants for further treatment or, as a last resort, sent to landfills. This significant and flexible approach to reducing the need for landfill or incineration has not been included in the Government’s Blueprint. Waste sorting plants require manual input, and will therefore create jobs, while the recovery of recyclable materials creates additional job opportunities in the downstream recycling industries. 2.5 The Government proposals are based on taking the line of least resistance, the soft option, in the hope the community will not realise the long term social, economic and environmental impacts. Government fails to focus on addressing the fundamental problems, or to put forward proposals that are both comprehensive and flexible, including solutions which are capable of being achieved quickly and with community support. It is essential to adopt measures that focus on changing public attitudes, and reducing waste at source. An incinerator at SKC will not be available until 2021/22 by which time the total volume of MSW could be substantially reduced by adopting a comprehensive sorting and recycling plan coupled with active, widespread public education. 2.6 Government claims an urgent solution is needed, yet proposes to build an incinerator on a site that does not yet exist, thereby delaying the commissioning of the facility by several years. If Hong Kong does indeed need an urgent solution, then clearly the facility should be constructed as soon as possible. This indicates construction should be on land that already exists and which was identified as being suitable during the Government’s site selection process, namely the site at the TTAL. The Government’s claim for urgency has no credibility if it insists on selecting a site requiring extensive reclamation works. 3.1 The Government proposal does not fully address the MSW problem, is piecemeal, and in any event is not likely to be completed in time to deal adequately with the volume of MSW being generated. More practical and flexible alternatives should be urgently implemented. The envisaged expansion of the landfill sites may not then be necessary or, at the very least, such expansion could be reduced in size or delayed by adopting IWMAG’s “Plan B”. All MSW should be processed through mechanical waste sorting plants before going to waste-to-energy plants or to land fill. 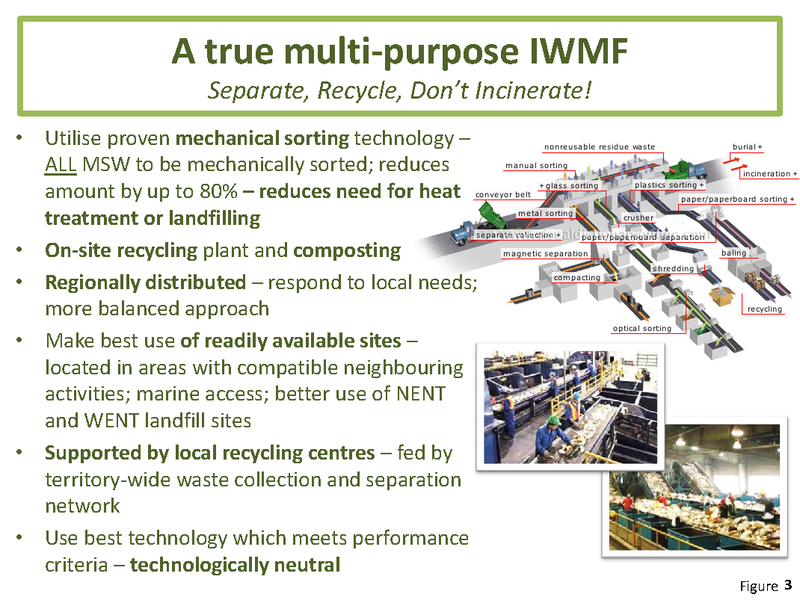 As a LAST RESORT small scale waste-to-energy plants (thermal treatment by incinerators or gasification plants) should be provided within some of these sites to reduce quantity of MSW going to landfill. Site 1 : NENT Landfill site – 155ha – to include two waste sorting lines with a total capacity of 1,400 tpd, recycling plants, compositing plant and a small waste to energy plant for 600tpd. Site 2 : Tseung Kwan O Area 137 – 8.9ha – formed and with sea access – to include two waste sorting lines with a total capacity of 1,400 tpd, recycling plants and composting plant. Site 3 : NE Lantau – 8.9ha – formed and with sea access, part located in cavern under hills; to include two waste sorting lines with a total capacity of 1,400 tpd, recycling plant, composting plant and education centre. Site 4 : WENT Landfill – 200ha formed and with sea access – to include three waste sorting lines with a total capacity of 2,100 tpd, recycling plants, composting plant and a waste-to-energy plant for 600tpd. The mix of facilities illustrates the benefit of a regional and integrated approach where the key is flexibility such that the actual facilities on each regional site can be adjusted over time to meet changing needs, and avoid massive investment in any one particular facility. 3.5 There are many examples of waste sorting plants of various sizes operating around the world. Some of these are manufactured in China. They can consist of modules for different purposes (see Figure 3). An example can be seen at http://www.youtube.com/watch?v=YxevVBAeN4s while many other videos of these machines in action can be found at http://www.youtube.com/watch?v=wugmX85ipRU. They are usually contained within one large warehouse-type building and they include relatively unsophisticated equipment such as conveyor belts and other machines in a production line. They create jobs on-site and off-site through downstream recycling. 3.6 An assumption has been made that waste sorting lines handling 700tpd would be appropriate, and more than one line could be located at each site to accommodate the amount of MSW that needs to be processed for that particular area. The actual number required would depend on the effectiveness of the waste reduction measures that would be implemented as part of the overall strategy. There are no specific environmental concerns arising from the use of this type of facility. 3.7 Plan B does not require a large-scale incinerator for Hong Kong. After waste sorting, it is estimated that the remaining amount of MSW for treatment by thermal means would be about 1,200tpd and that could be distributed to two small plants of around 600tpd. It is proposed that one thermal treatment facility can be located as part of the totally integrated facilities at each of the NENT and WENT landfill sites. With plants of this size it would be possible to consider either modern incinerators or plasma methods of thermal treatment, as there are plasma plants with this capacity operational elsewhere in the world. Whichever is adopted would need to meet the highest environmental and safety standards. 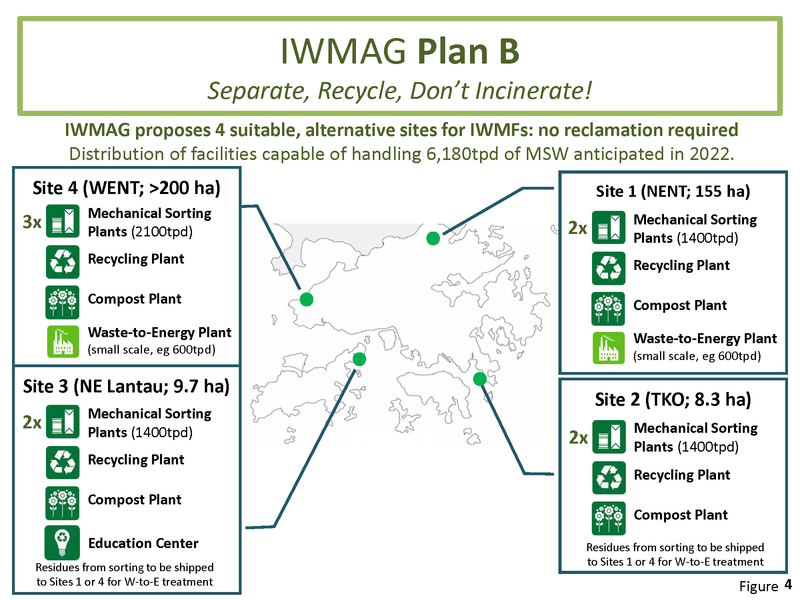 3.8 With the change in land use zoning proposed by IWMAG, the use of the NENT and WENT landfill sites, and Area 137 in Tsueng Kwan O, the waste sorting plants could be in place and operating within a 3 year period if policy priority is given to them. This would be achievable within the 2017 deadline. Regardless of the discussion that may be on-going regarding landfill extensions or the appropriate waste-to-energy plants to install, these waste sorting facilities and re-cycling plants should be put in place as part of a sensible, well-rounded waste management strategy. This has also recently been announced by Secretary for the Environment, Mr. Wong Kam Shing. 4.2 IWMAG’s analysis has shown that such a masterplan is necessary and their “PLAN B” is in reality a flexible, high level “strategic masterplan” which needs to now be developed and expanded in greater detail. In view of this need now being recognised by the Bureau, it would be fundamentally wrong to give support to spending billions of dollars of taxpayer’s money for an incinerator before the masterplan has been completed. 5.1 Members are urged not to endorse the Government’s request for approval of the funding for the incinerator at SKC and the extension of the three landfill sites. These proposals are outdated, do not represent a cohesive strategy for waste management, and are not sustainable in the long term. A strategic review is necessary. 5.2 Instead the Environment Bureau should be asked to revise those parts of their current MSW Waste Plan to incorporate mechanical waste sorting facilities, major investment in recycling plants of an industrial scale, and to make best use of the existing land that is available and can be used quickly. This should be done as a matter of urgency and would be unlikely to compromise a long term masterplan, as it is a flexible approach and has significantly less need for funding. This entry was posted in Info and tagged HK, Hong Kong, IWMF, landfill, Legco, Panel on Environmental Affairs, Waste, Waste management. Bookmark the permalink.